Copy of the Anglo-Saxon rune poem in George Hickes’ “Linguarum veterum septentrionalium thesaurus grammatico-criticus et archæologicus” (Oxford, 1705), copied from Cotton MS Otho B.x folios 165a-165b, which was destroyed in the 1731 fire. 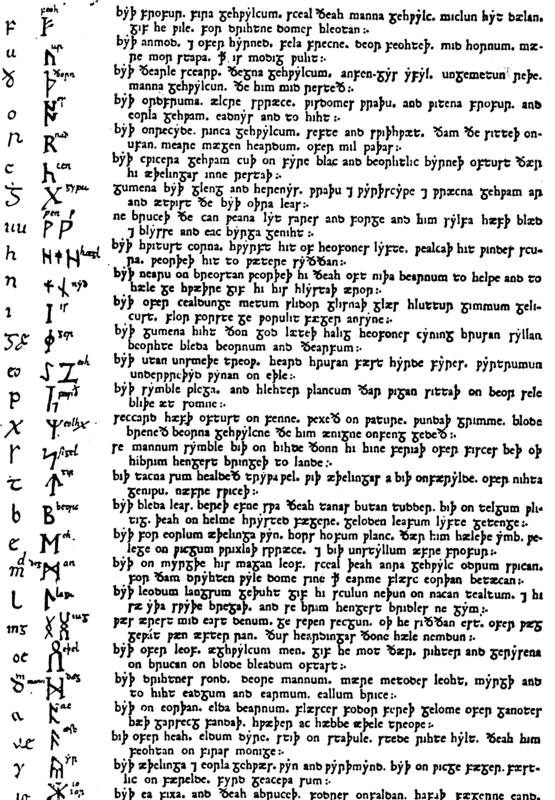 Abstract: In 1703, George Hickes published the Linguarum veterum septentrionalium thesaurus grammatico-criticus et archæologicus, which contained the first edition of the Anglo-Saxon runic poem. As a result of the Cottonian fire in 1731, his edition also became the only source for the poem. In this thesis I re-examine the first edition from a runological perspective within the context of its publication in the Thesaurus. Since the early twentieth century, doubts have been raised about the authenticity of the runic poem as printed by Hickes. Scholars noticed similarities with another runic alphabet in the Thesaurus, copied from MS Cotton Domitian A. IX, and began questioning if all the information exhibited in the Thesaurus edition had in fact been present in the original manuscript, MS Cotton Otho B. X. The aim of this thesis is to reassess the material and investigate some of the assumptions upon which these doubts are based. I provide the necessary historical contextualisation and a framework for the subsequent investigation through a study of the poem’s publication history and the information supplied in catalogue descriptions predating the fire. This is supplemented by an overview of the scholarship on the poem and a detailed explanation of the authenticity debate. I consider the runic poem in its most basic form, as a runic alphabet, and compare its runes and rune-names with the other Anglo-Saxon runic material collected in the Thesaurus. The aim of this comparison is to determine whether the text has been modified or supplemented by any of its editors, if there are in fact correspondences with the runic alphabet from Cotton Domitian A. IX, and if so, whether and how this has had an impact on the perception of the runic poem. I also seek to investigate the existence of a runic standard for manuscript runes by comparing the form of the runes in the various alphabets of the Thesaurus, and applying David Parsons’ theory of standardisation. Finally, I compare these results with the conclusions of the authenticity debate in order to determine their impact, and establish how both the results and the reasoning behind them can contribute to the discipline of manuscript runology.